The need for continued worldwide animal conservation has been vividly underlined by the publication of the latest IUCN Red List of threatened species according to one expert. Biosphere Expeditions has been helping to provide information for the Red List on many fronts, for example by carrying out a project in Western Australia to provide vital information about the iconic Australian flatback turtles (Natator depressus). 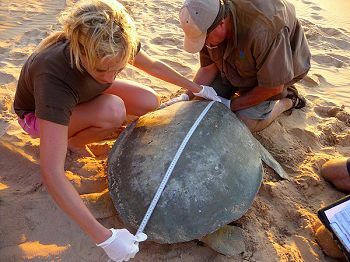 A volunteer helping to measure an Australian flatback. These Australian flatback turtles are still listed as ‘Data Deficient’ by the IUCN and the results of this project will go a long way to assisting to fill in the information gap for this species. “What organisations such as Biosphere Expeditions can do is give ordinary people the opportunity to go on projects, such as the one in Western Australia, where they can assist scientists in work that really can make a difference,” said Hammer.